← Sunday 14th June 2015 – Gardeners World Live at the NEC!! Tuesday 16th June 2015 – My staging has arrived!! 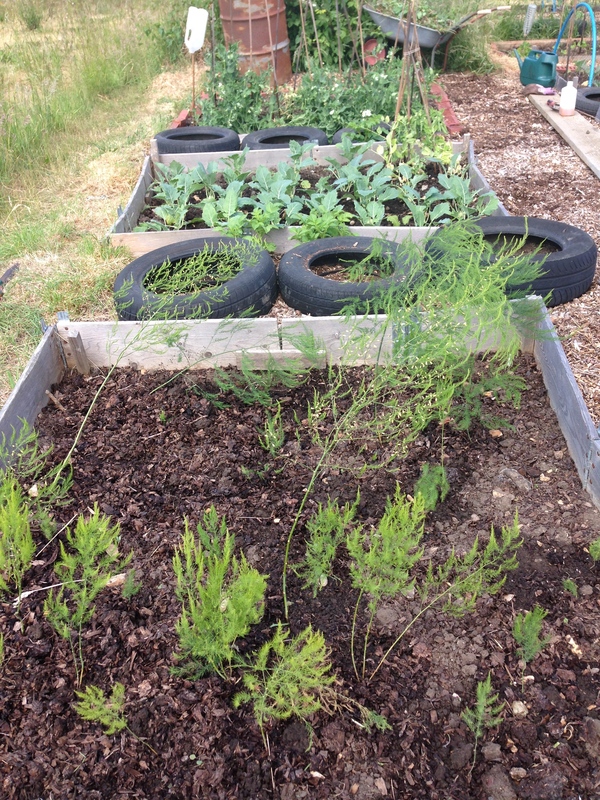 Now on the allotment today it’s the time to go through your beds one by one and weed and water. Some sections of my allotment are a little rustic at the moment (or messy), but I’ll get to them soon. So I started to systematically go through as many as I could get through today. I managed to meticulously go through 3 beds, and once I’d weeded, I watered and fed with Seaweed Fertiliser. I cut any grass round their edges and weeded any unwanted bits from the paths. It was a warm day today so lots of water was needed in the 4 hours that I was playing. Now let’s try and keep you this weed free for the entire summer!! Some of my Sugar Snap peas are ready, so before I harvested some I had to try one. Oh they are so sweet and crunchy. 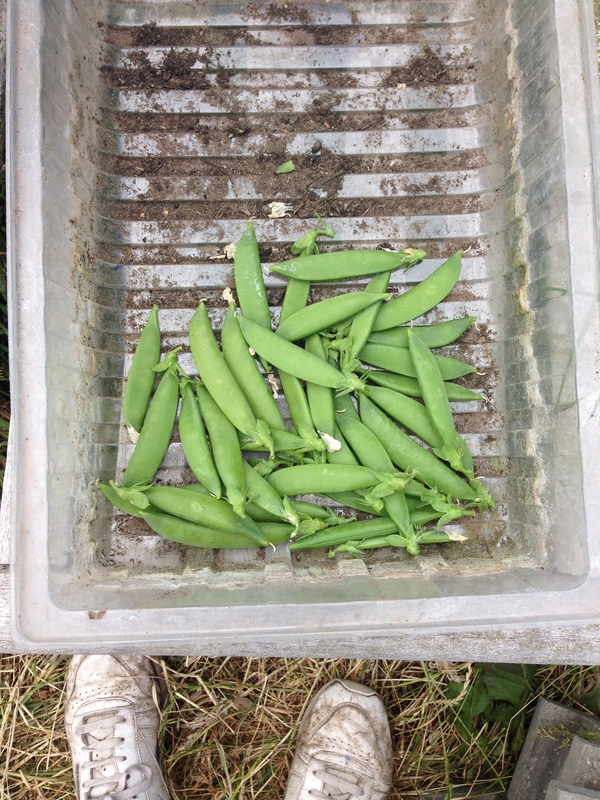 Sugar Snaps are much easier to harvest that Mangetout. You may be thinking “What does she mean?”, but Mangetout is perfect for 2 days maximum on the plant before it goes past it’s best, where as Sugar Snap don’t mind if they get fat and don’t go past their best as quickly. Hope that makes sense. We’ll have what I harvested for dinner tonight. There are more that’ll be ready in a couple of days so that’s really exciting. The first of the Sugar Snap peas!! When I got home there was a card put through my door for an attempted delivery of my greenhouse staging from The Greenhouse People. Bugger I’d missed it!! But I wasn’t expecting it to be this early in the week. I was online making another date for delivery when the delivery man turned up!! He had just decided to come back again, on the off chance I was in. What a lovely man he was. I was so grateful that he did otherwise I’d have had to stay at home for a day and wait for it to arrive. It’s very heavy and sitting in the hallway at the moment. I’ll start to put it together most probably at the weekend because this week I’m hoping to spend all of it on the allotment. I’ll take a picture of it when it’s in the greenhouse so you can see. This entry was posted in Uncategorized and tagged claire's allotment, mangetout, shropshire seaweed fertiliser, sugar snap peas, The Greenhouse People. Bookmark the permalink. 3 Responses to Tuesday 16th June 2015 – My staging has arrived!! There’s a lot more to do.